constellations (that my parents tried SO very hard to teach me the names of) I couldn't help but think how lovely it is to be surrounded by such beauty. The hottest nursery trends may come and go but Mother Nature is constant and every expert is in agreement that continuity is something that every baby needs. 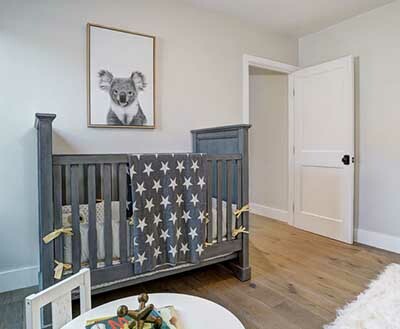 Here are some elegant as well as a few fun ways to set the tone of natural continuity in the baby's room with moon and stars nursery theme ideas contributed by some of our creative visitors and professionals whose work that I admire. 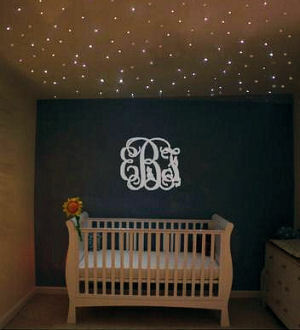 A baby room bathed in soft light from above simulates a midnight sky filled with twinkling stars. A unique nursery light system gives a sense of "other-worldliness" to the room that is much softer than traditional ceiling lights and lamps. 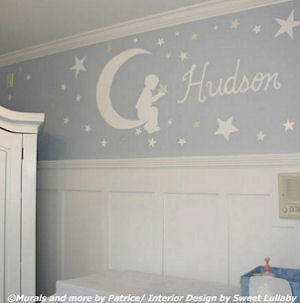 This moon and stars baby nursery theme with its dark navy walls from paint to the crib bedding is completely gender neutral. The wooden wall letters in this picture are "all girl" but a monogram in a masculine font is available. We're seeing stars in as many boy nursery pictures as we are in nurseries decorated for baby girls...we're seeing stars…everywhere. 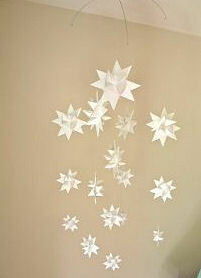 I'm not the only decorator with moon and stars baby nursery theme ideas dancing in her brain. The blue and white paint color scheme of this room with just a touch of silver creates a peaceful atmosphere. I found the painting of a little boy sitting on the moon while reaching for the stars very inspirational. Koala bears are stars in their own right and they are even more fabulous when they are accompanies by a beautiful neutral crib quilt with stars. Make your own crib mobile using your mad origami skills. Decorations that we make ourselves, especially ones that will blend into the decor of the home when baby is out of the crib, are super money-savers. 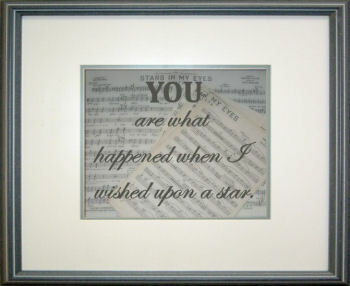 A star themed wall quote is another decorative nursery item that mom can make. Baby will love to know that he (or she) is what happened when Mommy and Daddy wished upon a star. Thanks for visiting Unique Baby Gear Ideas and I hope that you will take a moment to upload pictures featuring your own moon and stars baby nursery theme ideas using one of the forms provided for your convenience.